Every once in a while, we find that our plumbing is failing on us. Pipes can get noisy and leaky for any number of reasons, and even the most reliable plumbing fixtures need periodic maintenance. In particular, galvanized pipe corrodes from the inside out after time. The older domestic copper would virtually last forever, but the copper pipe imported from China is of such poor quality that it also erodes. Some of these jobs can be done relatively easily on your own time, but you need to be sure you know what youre getting into. Remember these tips for repairing and replacing your old pipes when you decide to take on a plumbing project. The classic blunder of many home owners is going into a project without having all the tools they need. As the saying goes, there is a right tool for every job—and if you dont have the right tools, youre not going to get the job done right. If you dont already have a tool set varied enough to cover the necessities of your project, ask if you can borrow from a friend or family member. Just dont try to wing it without the proper tools. Or, since you are tackling the job yourself, and saving labor charges, it is justifiable to purchase what you need. After the job is complete, you will still have the tool. Forgetting to shut off the water before starting plumbing repairs is the cause of some of the most catastrophic mistakes for many do-it-yourself plumbers. There is water on city pressure throughout your homes pipes all the time, not just when you turn on the faucet. Trying to work on a pipe that hasnt been cut off from its water supply will get you a spray in the face if youre lucky. If youre not lucky, you could end up flooding rooms and damaging your home, making even more work for yourself. 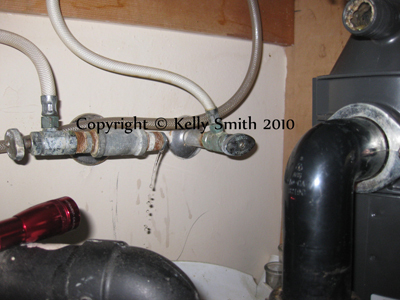 Many homes have a valve where the supply enters the home. However, if your building contractor cut corners and didnt install one for your convenience, you will have to valve it off at the meter—and you will need a special tool for that. Theyre cheap at Home Depot. Some of the pipes in your home are made from ABS or PVC. These are tough plastic materials that can stand up to all the chemicals that run through your pipes every day. They are durable, but may become brittle over time and occasionally needs replacing. Fittings for these pipes are attached using solvent glue which is difficult to remove, so the best way to get around this is often to cut out the old section of pipe with a hacksaw and install new fittings. You may have galvanized steel pipes. You will need a pair of pipe wrenches to unscrew pipe sections from the fittings. With small diameter pipe you can work with Channellock 12 in. tongue and groove pliers. For your metal pipes, removing and replacing an entire section of pipe can be a difficult task. When you start to unscrew one end of a pipe, youre tightening the other end. The difficulty of getting around problems like this often makes it easier to patch a leaky pipe when possible. Patch kits for pipes can be found at most hardware stores. Alternately, you can make your own patches using a piece of heavy rubber—heavy sheet rubber is a good material for pipe patches. Use two or three hose clamps to hold your patch in place; it makes a reliable fix that can last for years. If you are working with steel, you will probably need to have your pipe cut and threaded. Just take the old material to Home Depot to match and they will do it very inexpensively or even free if you purchase everything there. When you reassemble, dont forget to use plenty of Teflon® tape on the threads. If working with plastic, just cut everything to length with your hacksaw. Then, dry-fit all the parts to make sure everything is perfect. When you reassemble, first apply PVC primer and let it dry (just takes a second; it is very volatile). Next, just apply PVC cement over the primer and put it together. Work quickly though; the open time is rather short. If you happen to be working with copper lines, you can cut it with a hack saw, and then you will have to sweat the joints to make the connections. For this, you will need a small torch, flux, and solder. Valve the water supply back on slowly and let it come back to city pressure while checking for leaks. It is easier if a helper mans the valve while you keep an eye on the work. Run the water at the faucet, toilet, etc. that is affected by the repair. Make any tightening adjustments needed. Plumbing isnt easy or predictable, which is why companies like Filan & Conner exist to lend a hand when you get in over your head. You might run into old lead or ceramic pipes, corroded joints, or any number of other problems. Improperly tightening or loosening a pipe could damage surrounding pipes and increase your problems. If you feel like youre diving a bit too deep, dont hesitate to call in the professionals.